Participants will be certified "IBAF Technical Commissioners"
The International Baseball Federation (IBAF) will be holding the 2012 edition of an educational clinic for Technical Commissioners in Japan, August 23 - 26. The clinic will be organized in the aim of developing baseball experts that are capable of working at an IBAF official competition and looks to strengthen the presence of commissioners from Asian Region a traditional baseball powerhouse. Technical Commissioners are an integral part of the IBAF event organization, overseeing the technical operation of the event and working along with personnel of the IBAF and Local Organizing Committee. 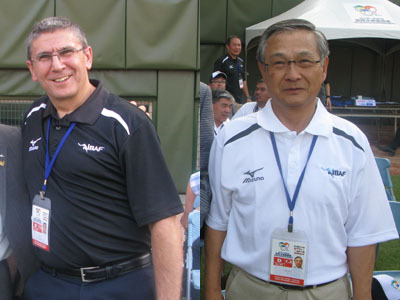 Hosted by the Baseball Federation of Japan (BFJ), the program will look to provide the participants overall understanding of what is needed to work as Technical Commissioners at IBAF events and will be led by Jim Baba, Chairman of IBAF Tournament Commission and a veteran of international baseball. The participants will be visiting various technical matters from a comprehensive approach with a classroom course for one day and on-field work the following day. National Federations of Australia, Chinese Taipei, China, Hong Kong and Korea may nominate up to two participants and the final attendees will be determined based on the availability and suitability and will be subject to the approval of the IBAF. Registration: Registration is free of charge. Australia, Chinese Taipei, China, Hong Kong and Korea may nominate up to two officials respectively. They will be joined by a few Japanese officials. Cost: Full board of lodging and ground transport from Narita or Haneda airport will be provided to all participants free of charge and international flights shall be covered by National Federations sending the representatives. 2) Solid experience and knowledge in Baseball. Nominations may be submitted by June 30th at ibaf.office@ibaf.org. Participants that successfully complete the program will be certified as "IBAF Technical Commissioners", that will be given an opportunity to work future IBAF events, although being certified does not guarantee an IBAF assignment.